DENALI TRAINING PROGRAM: FIT AND STRONG TO 20,320 FEET. Climbing Denali is a serious undertaking! So your program training to climb Denali must also be a serious undertaking. The rigors of a 3-week expedition to high altitude require a lot of effort from its team members. Not only does being fit make the experience a lot more enjoyable, it is practically a prerequisite for expedition mountaineering and can make or break the climb. Besides spending long hours travelling the glacier and gaining altitude while carrying a heavy pack and pulling a sled, it is hard work setting up camp, shoveling tent platforms, and building snow walls. The more physically prepared you are for this workload; the better becomes your chance of success on the mountain. The training program we describe here is designed to get you fit and strong within a six-month period. This assumes that you already have a basic level of fitness (you should be used to about 3-4 hours of exercise per week), some prior mountaineering experience, and have done long hikes with heavy boots and a pack. The program is based on the concept of progression, which means increasing the length and also intensity for your workouts gradually and systematically to adapt your body to higher and higher effort levels, preparing you for 8 to 10-hour days on the mountain. To achieve this adaptation, both specific (simulating the climbing on Denali) and non-specific (general endurance work-outs such as running, biking, cross-country skiing) training methods are used. Our structured training program is split up into macro-cycles of 1-month sections incorporating workouts of endurance, intensity, conditioning, and rest. You’ll need to adjust the program to work for your level of fitness, your schedule, and your training environment. Check with your personal physician and have a physical done before you start “you must be healthy to handle these workouts! A rough number for your max heart rate is 220 minus your age. ENDURANCE – Aerobic fitness is gained by working out at a constant sub-maximum heart rate (about 65%) for longer than 30-45 min. The intensity level should be such that you can carry on a conversation, but are breaking a sweat. Hiking, running, cycling, cross-country skiing are all good ways of building endurance. You’ll spend most of your time on these. INTENSITY – A workout with your heart rate up to 80% of max, now your breathing hard! Think about climbing a steep section of the glacier with a heavy pack in deep snow… You’ll work up to doing these workouts later in the schedule. CONDITIONING – An important part of your preparation! A strong body, especially a strong core, is necessary for all sorts of things, such as carrying a heavy pack, building camp, and carrying your loads back down the mountain. It also is a key element in preventing injuries and keeping your body balanced. This conditioning can be achieved in a variety of ways, choose what works best for you: cross-fit, yoga,pilates, strength training in the gym, or else. REST – Each week has rest days and the end of each 4-week macro-cycle has a good rest period to allow for physical and mental recovery before the next block. Don’t skip these! The body needs this time to adapt to the progressively harder workouts. 6 Months pre-trip – Focus on increasing aerobic capacity with endurance training and getting a conditioning program started. Plan to spend about 4-6 hours per week doing general endurance training (outdoors or indoors, hike trails, run, bike, swim, ski, stair-master, etc.) with workouts lasting 40 mins to 1 hour and one longer one lasting up to 1 1/2 hours of easy pace, and workout (45 min long) of conditioning (choose your own). You should have 3 rest days per week. At the end of the month, take 4-5 days completely off from your training, which will give you a good time to recharge mentally and physically. 5 Months pre-trip – Focus on increasing the length on your endurance workouts. Spend 5-7 hours per week doing general endurance training, starting to focus more on hiking / running / snowshoeing if possible and less on other exercises such as biking. Work up to a 2 hour-long workout at an easy pace each week. Keep with your routine of 1 session per week of conditioning. Take 2-3 rest days per week and 3-4 days completely off at the end of the month. 4 Months pre-trip – Focus on all-around improvement ““ creating a foundation for the serious training block coming up.Spend 6-8 hours per week on endurance training (again, try to incorporate specific training: hiking, running or cross country skiing). Start using your backpack. Add a work-out of 30 min of higher intensity training (heart rate 80% of max) ““ this could be for example running on hilly trails, hiking a steep mountain trail, a faster bike ride, or a skate skiing workout. Be sure to warm up and cool down for this workout. One of your endurance workouts should be up to 2 hr long. Keep with your conditioning routine or add a second session. Be disciplined and take 2-3 rest days per week. Take 3-4 days completely off at the end of the month. And take a deep breath ““ now we’re getting serious! 3 Months pre-trip – Focus on specific training. Try to train with your pack loaded with increasing weight. Try to get out on trails for your hikes and use your boots. If you can’t get out to do the specific training, do stair master workouts or something similar. Do 2 sessions of conditioning per week. One workout with 30-40 min of higher intensity integrated in it is preparing you for harder efforts on the mountain. 2 Months pre-trip – Focus on longer workouts. 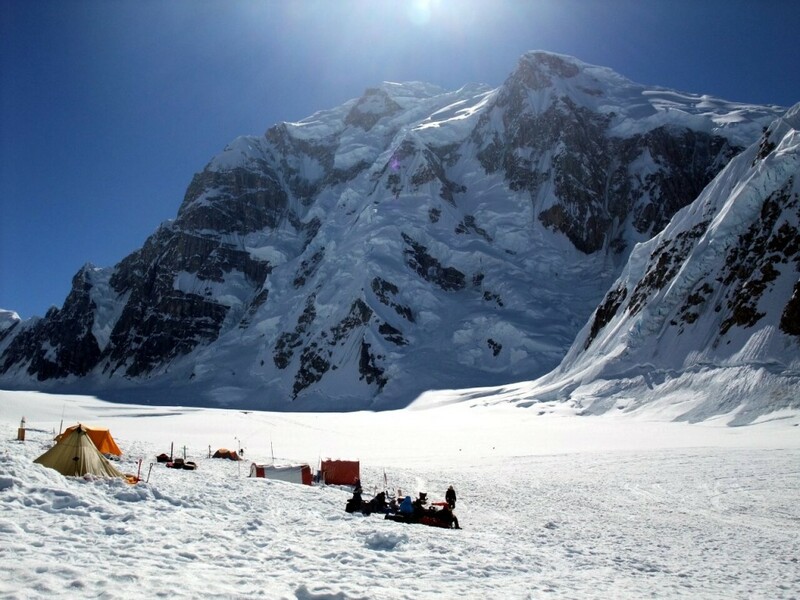 By increasing the length of your workouts you are getting ready for the long days on Denali. Try to do one long workout per week, a hilly hike would be best and the pace shouldn’t be too hard. Keep with your 2-session conditioning routine. Also keep your once-a-week intensity workout. Rest and relax at the end of the month. 1 Month pre-trip – Focus on adding intensity. This is the final 4 weeks of preparation. Your base fitness should continue to get stronger. Adding one harder workout (a second intensity session) will give you the ability to withstand fatigue better once you get to the mountain. Keep with your conditioning routine ““ increase the effort in your sessions. Do as much specific training as possible in your endurance and intensity workouts ““ this is when it really matters. At the end of the 4 weeks make sure you have several days of complete rest and recovery. Easy stretching or yoga would be great for this time. It’s important to come to the expedition ready and relaxed ““ you want to be well rested and chomping at the bit to get going. Of course everyone has a different body, a different work schedule, and a different terrain to train in. For this reason you must make adjustments to your own personal training plan. Make it work within your possibilities. Switch the training days around if necessary. If you don’t have any mountains to climb nearby, try to at least hike outside some and do some stair-master workouts,climb the stair flights of a high-rise building, or cross-country ski (and carry your pack). If you can, find some hilly trails nearby and occasionally try to do longer climbs in the mountains. If it’s dark when you come home from work, try an indoor routine and get outside on the weekends. Be creative. A bit of general advise: A 6-month training program can seem long and daunting. Don’t get overwhelmed ““ instead, take it day by day. If you fall behind, don’t try to catch up by taking short cuts ““ adjust your progression to what is manageable for you. Also, don’t increase your workload too fast ““ you’ll risk getting injured or too tired. Listen to your body! If you’re sore every day ““ you’re training too hard. Find partners to do your workouts with ““ it’s more fun and keeps you honest. If you develop an injury, back off right away ““ don’t let it get bad. Adjust your workouts and see a doctor. Nutrition and Hydration: It’s important to develop good eating and drinking habits when you exercise frequently. Remember that this is what fuels your body! On long workout days (more than 1 HR), bring snacks with you (e.g. gels, bars, dried fruit, etc.) and drink water often. Drink several quarts of water a day if you sweat a lot. Replace your lost electrolytes after exercise ““ it will help you recover faster. Dehydration is hard on your body ““ try to avoid it. A final word: Besides being physically fit, an expedition takes a lot of preparation. You should train with all your gear (including your pack, your mountaineering clothes, boots, harness, personal gear, and so on). You should also mentally prepare ““ an expedition is always an adventure and the altitude, the weather,and the glacial environment can be very taxing at times. Be ready for the unexpected!